So much yarn, so little time. : Thanksgiving Giveaway! 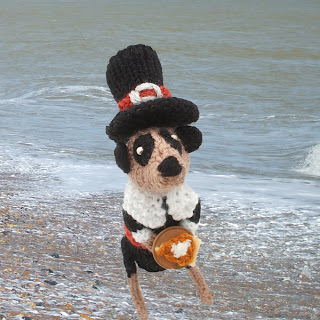 I'm thankful for all the support my virtual friends and customers across the world have given me over this year, so Meerkat Pilgrim Father would love to come and share his slice of Pumpkin Pie with one of you! To enter, select an item from my Zibbet shop and leave the link in a comment below telling me WHO you think would love it. Be sure to leave me a way to find you - email, shop link, twitter link, facebook. Want to enter a second time? Promote this giveaway ONCE in any way you wish - twitter, facebook, blog, stumbleupon, anything - and let me know what you've done in a separate comment, again remembering to leave me a way to contact you. Please don't promote more than once, I don't want everyone to hate me! My mom would love the Christmas Nativity Meerkats! My son always loved Rudolph....so do I! My grandmother would love your Meerkat nativity. I would love this Worf Meerkat - fantastic! I would get Locutus, the Borg meerkat for my hubby who is a huge Star Trek fan! I think my friend who is in the hospital would love a trekkie Meerkat- Maybe Loctus! My daughter would LOVE this http://www.zibbet.com/NiftyKnits/artwork?artworkId=88328 she loves soccer and loves the Italy team. Your banner is so cute at your shop. My cousin tammy would totally get a kick out of of the star trek ones! Your meercats are awesome. Not to mention your kangaroos and reptiles. My niece would love these meerkats. My best friend would love your unicorn. D: She's convinced that they're real, and somewhat obsessed! Tee hee, my boyfriend would definitely appreciate the Hulk Meerkat. I think my pet bearded dragon would love to have a little friend! Heather, I love this guy, so cute! My dear friend, Vi, is a tremendous crèche collector and I'm CERTAIN she won't have this! I tweeted your little giveaway - I hope it brings you loads of visitors! I love all your meerkats, but I know my little granddaughter would just love Batman Meerkat! Definitely Batman Meerkat as my son thinks HE is batman, and we all know that batman is really a meerkat!